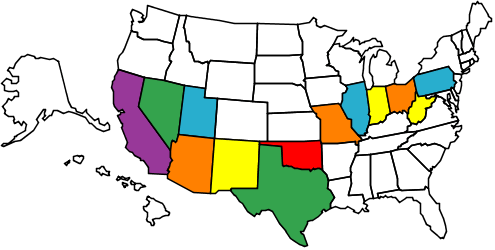 I found a fun post on Strawberry Freckles today where she shared the states that she has visited. I thought I would share the states that I have traveled as well. Between family trips to Florida or Texas, or trips across the country, I have been to quite a few. Hubs and I have driven back and forth across the country 6 times, once with Baybah. Each time we do, I am amazed with how beautiful our country really is. Each state is so different from the next. 2. New York City, NY- LOVE this place. It is like an art teachers dream with all of the museums and art galleries there. The Met and Moma are a-m-a-z-i-n-g! Soho, China Town, Broadway, I love it all. Would love to go back there sometime soon. 3. Denver, CO- Colorado is such a beautiful state, and Denver is such a cool city. I had the opportunity to go to Denver for an art conference, and fell in love with it. The city was so clean, had great shops and restaurants, and loved the free bus that helped you travel up and down the main strip. Would love to go to a Rockies game there someday! 4. Charlotte, NC- Hubs and I visited my sister and husband in Charlotte when they lived there. The sky was so blue, everything looked so new, the city was great, and the weather was awesome. We seriously almost considered moving there. Almost. 5. Washington, DC- Our nations capitol. I love all of the history, the museums, the buildings, and the pride that I get for my country when I am there. Such an amazing place! 6. Disneyland & Disney World- I know they are not cities, but they might as well be! I love these places for obvious reasons, they are the land of magic after all. I hope to take Baybah to both someday too. 7. Pittsburgh, Pa- My hometown. I love the city of bridges with one of the best skylines you will see. Just watch a Pirate game to find out. I love its hills, windy roads, sport teams, and people. It’s a drinking town with a football problem! I would really love to visit Hawaii someday and visit as many MLB ballparks as I can. Hubs and I have already visited quite a few! Where have you been? What are your favorite cities? Create your own map here. « Toddler Talk Thursday- What are Some Unusual Toys are in Your Toddler’s Toybox? Ok, I love this post! I am totally going to have to steal it! Heath really wants to go to Denver this summer, is there a lot to do you think with Hayden? It’s a 12 hour drive which isn’t too bad! We went to Denver pre Baybah, but I am sure there are a ton of things for families to do there. I will keep my eyes and ears open for kid friendly stuff there for you! You can always go to a baseball game. The stadium looks beautiful! No, we have never been. Drove by it a bunch of times though. If we pass through this summer, we will definitely go to a game with you guys! That is so cool! You should make it a goal to visit the rest of the states you havent been since there arent that many left. That’s fun. 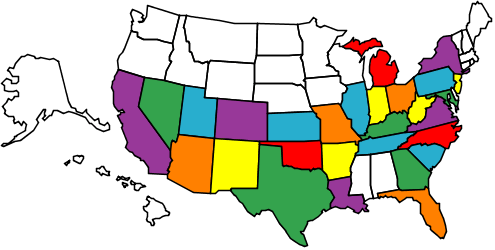 I use to have a phone book with a map & I colored in the states that I had been to. I’ve been to half of the US states. I’ve been to Hawaii & really didn’t like it. I know I’m crazy. Baybah has been a lot of places. I love this! And Love that you are traveling to MLB ballparks – we should take the babes to a 51s game this summer! That’s alot of travelling…what fun!! I’m now a GFC follower from the Say Hi Sunday blog hop. Hope you have a chance to check out my blog and maybe follow me back!! It was a lot of fun! Hope to do more of it! Thanks for stopping by, I am on my way over to say hi! oh I love san diego too!! you’ve been a LOT of places! wow! Are you going to BlogHer this year? That is where it is at!! You forgot California for Baybah, he attended cousins wedding in October at San Francisco. Oh my goodness. Yes, how could I forget? How fun! I love that you included places Baybah has been! Too cute. He’s a well traveled little toddler. I saw this on Emily’s blog and I just had to do one of my own. So Fun!